This tool does nothing! It only emulates a bad application. Bad Application allows you to change its process priority, start an endless loop (i.e. 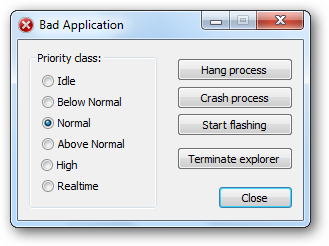 “hang” or stop responding) and crash its process. In addition, it can flash window and terminate the shell process – Windows Explorer. BadApp is mainly intended for testing purposes. Personally, I often use it to test my utilities which interact with other applications. Full source code is included with the distribution. You can use it as you wish. It’s FREE!